“Super earthquakes in Cascadia are nature’s equivalent to the World Trade Center disaster. But the potential losses are so much larger that they will affect the social fabric of the entire Northwest and dramatically alter the US and world economy.” – Robert Yeats, PhD., Oregon State University. Flying glass and bricks, buckling roads and freeways, airports suddenly crippled, nearly 500 people and 2 billion dollars worth of damage . . . the 6.8 magnitude earthquake literally shocked the entire Pacific Northwest region on February 28, 2001. But while the Nisqually quake was damaging, it wasn't the BIG ONE. Scientists say this was a relatively mild seismic event compared to the potential 9.0 plus magnitude disaster that awaits the 700-mile Cascadia region stretching from British Columbia to Northern California. In the past 15 years scientists have discovered shocking new evidence that all points to Cascadia experiencing a subduction zone earthquake 100 times greater than Nisqually and unlike any seen in US or even recorded history. Like a true detective story, Cascadia’s tale contains twists and turns that have sent world-class scientists scrambling around the globe to understand and piece together dramatic new evidence. From the bottom of the ocean to high tech satellites; from historic and revealing clues in Chile, Mexico, Alaska and Japan to colorful Native American stories, Cascadia uncovers a hidden and dangerous story. A recently discovered two week long “silent” earthquake initially startled scientists but is now helping them to more accurately forecast or predict major earthquakes. First hand accounts from Alaska’s great 1964 earthquake provides a human dimension, while breathtaking cinematography and state of the art animations reveal the hidden danger. 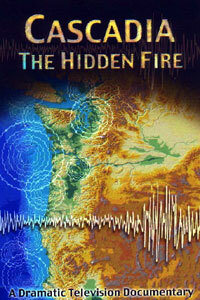 Cascadia: The Hidden Fire is the riveting story of scientists and ordinary people caught in extraordinary seismic events and discoveries around the globe. And what these seismic detectives are learning about Cascadia has brought us to a new threshold of earthquake prediction that will ultimately benefit the 2 billion people that live in super-quake prone areas along the Pacific Rim known as the Ring of Fire.